Cleaner by Pfarr uses a water based soil encapsulating cleaner that is room temperature, pH neutral, non-toxic, and leaves absolutely no soap residue. 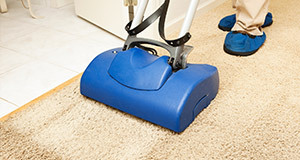 We effectively clean, disinfect, and deodorize your carpet every time! Your carpet dries quickly, looks great, and stays clean longer in between cleanings. Because carpet cleaners do not have the ability to rinse soap from your carpet like a wash machine can rinse soap from your clothes, you definitely do not want your carpet cleaned with anything that is soap or can leave a soap residue! How can you clean without soap? Our cleaning system is a water based process that dramatically penetrates the fiber, breaking down, lifting and suspending all types of soils. For the short time that the crystals are wet they are capable of trapping dirt and detergent residues. We use a pile lifting machine, with just enough of the wet crystal, to gently comb and move the crystal through the carpet fibers. This all quickly dries to non-ionic crystals. Non-ionic are non-bonding which means they won’t stick to or stay in your carpet! These crystals are easily vacuumed away. Restore a fresh clean look and feel to your home or office! Copyright © CLEANER by Pfarr, Inc. - 2016. All Rights Reserved.